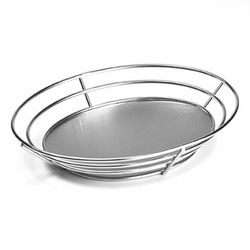 To offer breads like Roti, Naan, Parantha, we offer boat shape Stainless Steel Bread Basket hammered finished which looks stunning with the range of associated tablewares. The best thing is that it occupies minimal space, owing to its boat shape design. The basket can also be used to pack sweets, candies, chocolates, confectioneries, thus making it as an ideal gift. Navraj Exports are manufacturer and exporter of high quality Stainless Steel Tablewares item and offer wide range of Steel wares like Stainless steel basket, Polished hammered stainless steel bread basket adding beauty to the table. This is stainless steel bread basket with se through bottom, elegant and modern way to serve the bread. Keeping the diverse requirements of customers in mind, we are instrumental in providing Steel Basket.